[all-spoilers!] The crew have to steal Babylon 4 and save Sheridan from his time slippage. "Let us make an end of it quickly, before it stops me. I am as tired of my life as you are." -Ivanova and Cole are surprised on B4 by B4 military staff. Since Ivanova isn't wearing her EarthForce uniform anymore, things get hairy, but Cole leaps down and they dispatch the B4 staff together. Cole wrily notes that he hid as he knew it was the worst time to be discovered, so naturally they would be. His denn'bok has opened up a hidden access panel. -In 2278 on Centauri Prime, Sheridan is placed in a cell. He is flitting through time and is seen by Zathras. As Delenn, in the present, gets the sensation of someone walking over her grave, future-Delenn is placed in Sheridan's cell. Turns out they have a son together. He tells her she is from the past; she says they will forge something great together, but at great personal cost, and they can only avert the cost by losing to the Shadows. -Cole and Ivanova use the access panel to provide distractions to protect Sinclair and present-Delenn. They finally cut off their sector, and meet to rendezvous Sinclair and present-Delenn. -In the future, Sheridan and future-Delenn are brought before Mollari. He is exceptionally drunk, and there is an alien that looks like an oversized, tentacled wart on his neck. He calls it a "Keeper"; drinking to excess puts it to sleep and renders it visible. Mollari explains that he had to put on a good show for his "Keeper", a servant of the Shadows; he has a getaway ship for Sheridan and future-Delenn. They go down the hallway, but Sheridan is being pulled out of 2278; future-Delenn warns him not to go to Z'Ha'Dum. -G'Kar enters the throneroom, with a patch over his eye -- as we have seen before in Londo's visions of his death. Londo asks G'Kar to kill him, and calls G'kar "my old friend" (not Londo's "I'm about to screw you over" tell, "my good dear friend."). G'Kar obliges, but the Keeper reaweakens and forces Londo to choke G'Kar back. Vir walks in on their lifeless corpses, and picks up the Imperial Medallion from beside Londo's body. -Zathras has rigged up a spacesuit to contain Sheridan -- and it works. Sinclair, in an identical spacesuit, walks in to help Sheridan take the last components to the ship's power core. Ivanova has rigged a fake fusion reactor leak to trigger an evacuation, but B4 staff notice the power drop and just increase power to compensate. This throws B4 into a time rift, because the surge triggered Zathras' equipment early. They have been thrown four years into the future: into 2258, the year B4 appeared to B5. -Aaaand right around here is where B4 was when we joined it during the events of "Babylon Square" (or "Babylon Squared"). -Ivanova finally manages to trigger an evac order. -Sinclair is aging from re-exposure to the time rift; it's why he didn't want Garibaldi here. It would have killed him. -The time rift has jolted Sheridan back out of time. -Delenn seens a vision of the future: she's watching Sheridan sleep on B5, when a woman walks in and Delenn drops a snowglobe... Zathras this is a symptom of an unstable time stream, which he is trying to fix. -Ivanova briefly leaves Zathras, and he is arrested (which is how we find him in S1). -Lennier reports incoming ships: the ships from B5 in s1. -From now on, the narrative is largely as it was in s1: B4 is dangerously unstable. The 'blue suit' keeps popping in and our (Sheridan) until Zathras stabilizes him. Sinclair tries to touch Sheridan but is thrown back. -Zathras figures out that the system is stabilizing and asks everyone to leave. -Cole notices that, uh, Sheridan is here, but the phased-out blue suit is still over there. Someone swapped stabilizers. -Sinclair tries to warn the departing B5 ships... specifically, a warning to Garibaldi so he doesn't get shot, but they're out of range. He's despondent that he couldn't change the future. -Ivanova finishes prep: the time travel can now be controlled in C&C. Sinclair says he'll do it/ When Cole protests, Sinclair reveals he has to do it as he has done it already: the 900-year-old letters that he and Delenn received are in his handwriting. He goes into the past to help save Minbar. All Minbari belief is around three. Three castes: Worker, Warrior, Religious. Three languages: Light, Dark and Grey. The nine of the Grey Council, three times three. All is three. As you are three. As you are One. As you are the One. You [Sinclair] are the One who was. You [Delenn] are the One who is. And you--[Sheridan]... you are the One who will be. You are the beginning [Sinclair] of the story, and the middle [Delenn] of the story, and the end [Sheridan] of the story… that creates the next great story. -The Minbari-Human soul crossovers began a millennium ago. Her transformation was meant to bring balance to it. -The Triluminary that turned her half-human? Also from the same period. -What does this mean? Well, her letter asked her to bring the Triluminary -- it was never created, it just always was. Sinclair brought it into the past, using it to become the great Minbari leader Valen. He then deeded it to the Grey Council, along with his teachings (which formed the Grey Council) and prophecies. He is the "Minbari not born of Minbari." So basically the [strike]Triforce[/strike] Triluminary was never created? Its always existed in a time loop? Note that 900 years is an eternity to Americans. To Europeans, it's "Oh that's how old the neighborhood church is." I think if Michael O'Hare had been able to stay with the show to this point, the whole "The One" thing would have made much more sense; it's an...okay...way to resolve it, I guess. We also get more context for that fated moment between Londo and G'Kar. Chrysalis device...it came from Epsilon 3. There was one shot that should've been made more of, where we see a long box with a silver triangle on one side being set up, and left. Unfortunately, the shot didn't make much of it (you can see Zathras putting it out there), and a later shot we dropped showing it again because it wasn't properly featured and you couldn't really tell what it was. There was so much in this episode that had to be pulled off, in a short amount of time, that sometimes things in the background don't get framed as they might be. But that's where it came from: from Epsilon 3 to Sinclair to Delenn, who still has it. I still think this is what they envisioned for the final episode of the serie, would have been an awesome finale (looking at you Lost & BSG you really dropped the ball) but issues with Michael O’Hare prevented it. Still was awesome, especially at the time nobody did that on TV. A summary of the original plot outline got posted back in the thread on the season one end of this story by Banknote of the year, but it's worth bringing up again. 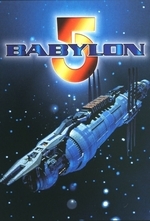 To summarize, Babylon 4 and its time travel shenanigans would have shown up as the core concept in a spin-off series titled Babylon Prime that would have directly followed Babylon 5's five season arc.